I am as old now as I was when I was a child in my first pair of overalls, standing at the edge of the garden with my face near a flower. I even wear the same smile, a smile a bee might wear if he suddenly discovered he was human. And I am as old as the bee. I am as old now as I was when the fall parade passed through our town, and I did not wonder where it had been or where it was going. And I am as old as the hand that I held while the music was playing. Thinking of the little picture in the oval frame on the piano. I in my singing make a grand life of it. Not one note would I strike from it. I in my night paint light of it. I of my death find no strife in it. I in glad rage take delight in it. As a Category, “Everything and Nothing” is roughly equivalent to “Marginalia,” but with an added twist: it’s the name of a book written by Ross Freeman, the hero of my unpublished novel, The Smiling Eyes of Children. Shall We Go See the Old Man? A confident, nattily-dressed frog smoking a fat cigar, by Glen Ragsdale (1955-1974). 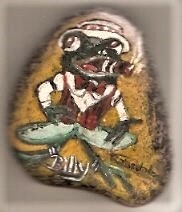 Title: “Billy.” Signed by the artist. On granite, about half an inch thick, worn smooth by the Kings River in California. Drawing for the New Revised Edition. Stories, Poems, and Memoir in Armenian Translation.